Decadent Dragon Bakery desserts crafted with gourmet, local and unique ingredients. Volume vs. 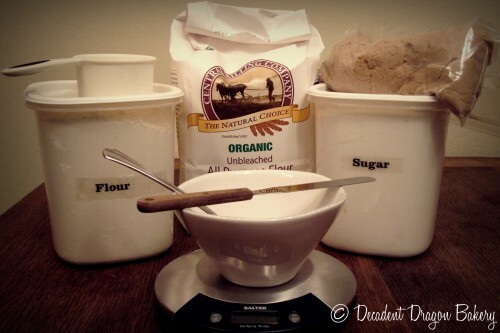 Weight in Baking: How do you measure flour? Scooping, spooning, leveling, sifting, tapping, weighing. 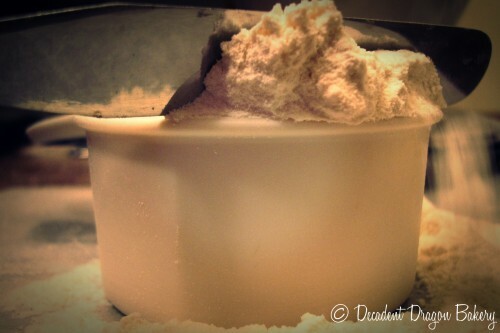 How do you measure flour and other baking ingredients? Do you ever have a recipe inexplicably fail? Or do you notice variations in how recipes turn out? Your method of measuring ingredients may be the reason. How do you measure flour? Baking is both science and art. Unlike hot food, we can’t willy-nilly throw ingredients into our recipes. It’s important to measure flour and other ingredients with precision. So I did a little test. I wanted to see how different measuring methods affected the amount of flour in our baked goods. I measured 1 cup of flour or sugar using different methods, and recorded the weight. The methods below are a sampling of those commonly used by home bakers. For each method, I sampled and weighed 6 times. Method #1: Scoop flour from bin and level with knife. Method #2: Scoop flour from bin and shake gently back and forth to level. Method #3: Spoon flour into the cup and level with knife. Method #4: Sift flour into cup and level with knife. I was always a scoop and shake girl (due to laziness). 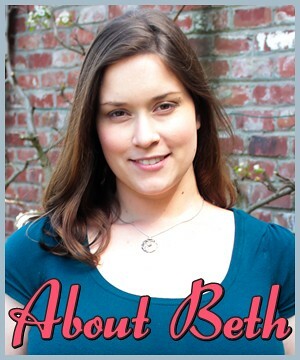 I know Deb from Smitten Kitchen is a spooner. I don’t think Ina Garten even attempts to level her measuring cups. What about you – what method do you swear by? I’m no mathematician. But the flour test results showed a 40 gram (1.5 ounce) difference depending on the method. Our most consistent method was spooning and leveling. This is a BIG difference and probably will affect more sensitive recipes. For sugar, the method mattered less. 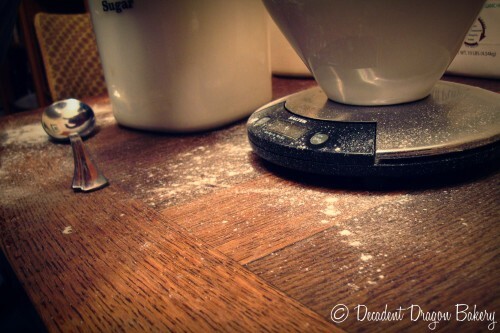 This makes sense: flour is easier to compress or aerate. Our results showed a difference of 19 grams (0.67 ounces). The most consistent method was again spooning and leveling. Note: I don’t pretend that my tests are truly scientific. But they are consistent with my experience. Feel free to disagree or prove me wrong! If you can, use a food scale to measure ingredients. Barring that, be sure you know what method the baker used when following their recipe. I’d also recommend you start converting your recipes to weight measurements. It makes doubling recipes easier. You can also use less measuring cups and dishes. It’s actually a big time saver. Bakers are a superstitious lot. We have our little ways to help recipes turn out just right. 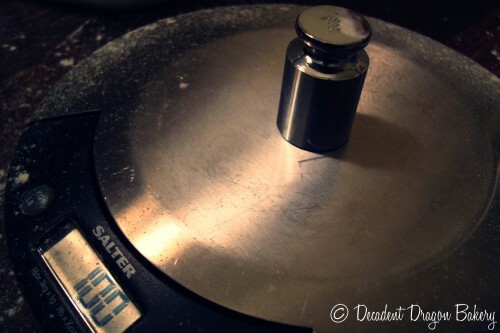 Using a food scale eliminates some of the mysticism of baking and is an important step if you are looking to turn semi-pro or professional. How do you measure flour? Are you surprised by these results? Let me know in the comments! My mom always taught me to “scant” cup measures if I was too lazy to sift them: whenever I measure flour, I remove a slight amount of flour from it to account for the flour being compacted. I’m always a little worried about removing the right amount each time, though. These numbers are really interesting. I think I may become a spooner after this! My baking has never been important enough to warrant this attention to detail, but I have noticed variations in my baked goods! I always blamed the oven. I would be interested in knowing which recipes are more sensitive to flour quantity? What do you think? Thanks, Ali! Most recipes can handle a small amount of variation. Now that I weigh my flour, my baked goods are more consistent. Before I started weighing, I would notice texture variations in items like cookies, cakes and pancakes. Sometimes cookie dough would be too dry or the cookies wouldn’t hold their shape after baking. I always use 3, I read it in a baking tips book once and it’s really improved my bread! Here’s a question, do you have any tips for converting your recipes to weight measurements? Do you just multiply the amount by the density, or is there more to it? Helen – I usually just measure the amount indicated by the recipe and record the weight next to the volume measurements. If the recipe turns out well, then I keep those weights. If not, I’ll start tweaking the weight a bit depending on what went wrong. This is a really interesting experiment. I like how you assessed repeat ability of measurement method. Since moving over to the ‘land of metric’ I find myself using a lot of local recipes that call for dry ingredients to be weighed. For example, when I bake a sourdough bread I use 450 gr flour, 100 gr starter, etc. ‘When in Rome…’ as they say, and, honestly, it’s easier as I’m surrounded by ‘mls’, ‘dls’ and the like! Where in the land of metric are you, Bea? Weight ingredients are pretty easy once you get used to ‘em, agreed? But it’s hard as most US recipes call for volume (sometimes I’m still lazy and don’t weigh). But metric measurements are more accurate AND you get to feel like a brilliant scientist doing lab experiments. What’s not to love? © 2014 Decadent Dragon Bakery. All Rights Reserved.